This article will introduce the partition magic to resize hard disk drive when laptop pops up low disk space warning message on Windows Server C drive. 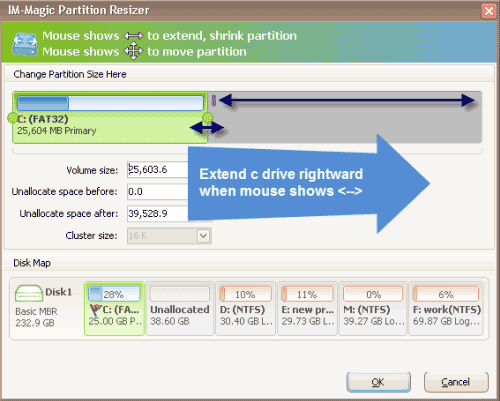 Download IM-Magic Partition Resizer Server to resize C drive when it is running out of disk space on Windows Server OS. 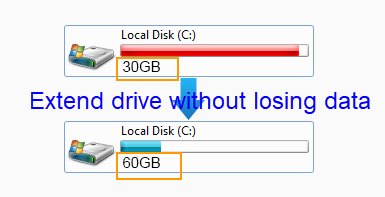 It is common to run out of space on C drive on Windows Server. It seems like that disk space is never enough no matter how large it is because new applications and Windows update are taking up the space every day. When there is insufficient available space on C drive, you will get low disk space warning message. At this time, you can use partition software IM-Magic Partition Resizer Server to resize hard disk so as to fix the low disk space on C. This partition software is compatible with all Windows Servers. Move the arrows to shrink the selected partition. Then, you can create some free space, which will be shown as unallocated space. When mouse shows double arrows, you can move the arrows to extend C drive. Finally, you need to click "Apply" button. Windows Server is a Server operating system of Microsoft, which can be installed on any type of laptop or desktop computer. When operating on a Windows Server laptop, it will pop up different kinds of messages in different situations. One of the most annoying situations when Windows Server pops up a warning message is low disk space on C drive. The warning message might be: "You are running out of disk space on local disk C. To free space on this drive by deleting old or unnecessary files, click here." Windows Server pops up low disk space on C drive when there is no enough free space to warn you that there might be potential danger if you cannot free space on the drive. Traditional method like deleting files, moving files or performing disk cleanup cannot free much space on C drive. Therefore, you need to rely on third-party partition software to increase the size of C drive. As long as the space of C drive on Windows Server can be expanded, system will stop showing disk space warning message. 1. I have been facing a terrible problem for several weeks. My laptop running Windows Server 2008 R2OS pops up an alert message that C drive runs on low disk space. I allocated about 20GB space on C drive, but all free space seems to be eaten up by different applications, programs and update files. At the beginning, the Windows only shows the low disk space warning every time I turn on my laptop. Then, the pop up message shows every several hours when I work on my computer. Can I disable the low disk space warning message safely? Or is there any way to fix the low disk space on my Server R2? 2. C drive is running on low disk space on my SBS 2003 C drive. I cannot install any application to this drive any more. I have deleted some unnecessary files and also moved some data to D drive. Then, I continue to run disk cleanup to free up space. However, the space on C drive is still not enough. Windows keeps showing low disk space alert. How can I free up the C drive?